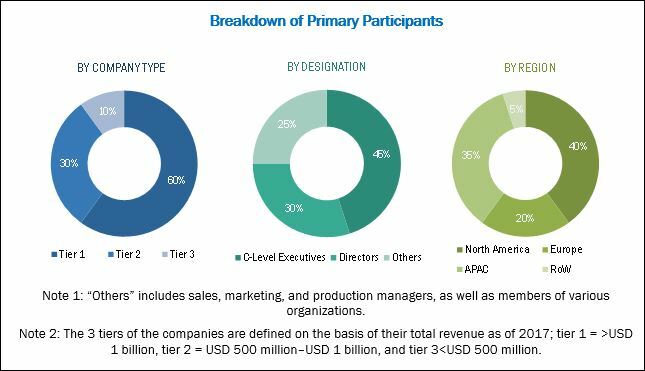 [134 Pages Report] The postal automation system market was valued at USD 710.5 Million in 2017 and is expected to reach USD 1,022.2 Million by 2023, at a CAGR of 6.30% during the forecast period. Growth in the e-commerce industry, increasing labor costs, and rising need for automated sorting and delivery processes in the postal industry are the key factors driving the growth of the market. The base year considered for the study is 2017, and the forecast period considered is between 2018 and 2023. To analyze the competitive developments such as contracts, mergers & acquisitions, product launches, and research and development (R&D) in the market. Research Methodology: This research study incorporates the use of secondary sources, annual reports, directories, and databases, such as Hoovers, Bloomberg BusinessWeek, Factiva, and OneSource, to identify and collect the useful information for the extensive technical, market-oriented, and commercial study of the market. To find the overall market size, top-down and bottom-up approaches have been used to estimate sizes of other individual markets by using percentage splits from secondary sources, such as Hoovers, Bloomberg BusinessWeek, Factiva, and OneSource, as well as with the help of primary research. The market breakdown and data triangulation procedures have been employed to complete the overall market engineering process and arrive at the exact statistics for all segments and subsegments. The entire procedure includes the study of the annual and financial reports of the top market players and extensive interviews with industry leaders such as CEOs, VPs, directors, and marketing executives for key insights (both qualitative and quantitative) pertaining to the market. Market Ecosystem: Key players operating in the postal automation system market include Siemens (Germany), Toshiba (Japan), NEC (Japan), SOLYSTIC (France), Pitney Bowes (US), Vanderlande (Japan), Fives Group (France), Leonardo (Italy), Lockheed Martin (US), Beumer Group (US), Dematic (US), Interroll (Switzerland), Eurosort Systems (Netherlands), Intelligrated (US), Fluence Automation (US), Bastian Solutions (US), Bowe Systec (Germany), GBI Intralogistics (US), ID Mail Systems (US), Opex (US), Planet Intelligent Systems (Germany), and OCM SRl (Italy). In this report, the overall market has been segmented on the basis of component, technology, application and region. The postal automation system market is expected to grow from USD 753.3 Million in 2018 to USD 1,022.2 Million by 2023, at a CAGR of 6.30% between 2018 and 2023. Factors that are driving the growth of the market include growth in e-commerce industry, increasing need for automated sorting and delivery processes in the postal industry, and rising labor costs. However, the declining volume of traditional mails, along with high initial investments and maintenance costs, is hindering the growth of the market. Evolution of traditional postal operations into smart, connected, and more efficient automated postal operations through the integration of Industry 4.0 practices provides growth opportunities for vendors in the market. The market has been segmented on the basis of component, application, technology, and region. 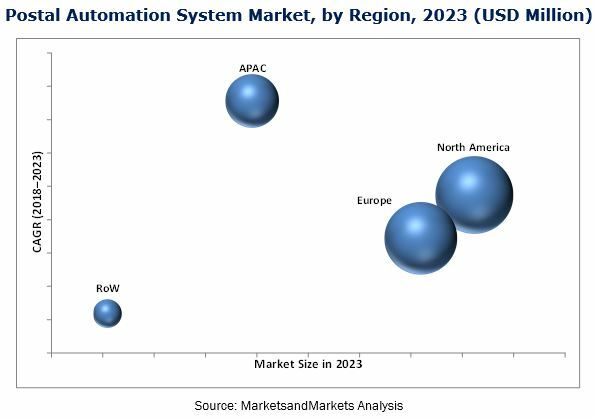 The postal automation system market, on the basis of component, has been segmented into hardware, software, and services. The market for services is expected to grow at the highest rate between 2018 and 2023. The leading position of hardware, in terms of market size, can be attributed to new system installations for capacity expansion and upgrades in sensors, processors, scanners, and recognition systems. However, these hardware systems require regular maintenance, along with hardware and software upgrades. High-value contracts are signed between automation equipment manufacturers and postal operators for after-sales services. Owing to this, the postal automation system market for services is expected to grow at the highest rate during the forecast period. By application, the market has been classified into government postal and courier, express, & parcel. Government postal applications are expected to hold a larger size of the market during the forecast period. However, the market for courier, express, & parcel (CEP) applications is expected to grow at a higher rate during the forecast period. . Increasing volumes of parcels and packages to be shipped and sorted by CEP companies, along with the rising expectation of customers for faster delivery, are some of the major factors contributing to the growth of the market for CEP applications. Parcel sorters held the largest size of the market in 2017. Sortation systems play a vital role in improving the efficiency of postal operations. Sortation systems, such as flat sorters and parcel sorters, are widely used by postal companies. However, rising parcel volumes had put postal operators under pressure for faster delivery of parcels. Postal operators are also adopting innovative automation technologies to sustain in the challenging business environments. Moreover, a decline in traditional mail volumes has put postal operators under pressure to upgrade their infrastructure for increasing parcel mail volumes. Parcel sorters, therefore, play a vital role in parcel delivery operations, and it is expected that their importance will grow in the coming years. North America is likely to account for the largest share of the overall market throughout the forecast period. The leading position of the region, in terms of market share, is primarily due to the presence of major postal and CEP companies in the region. Renovation of existing postal automation systems in North America has resulted in the installation or capacity expansion of these systems, thereby contributing to the growth of the market in the region. However, among all regions, the postal automation system market in APAC is expected to grow at the highest rate during the forecast period. High growth in the e-commerce industry in China, Japan, and India, among other countries in APAC, are creating huge growth opportunities for the players in the market in this region. Major challenges for players in the market include designing an advanced postal automation system in the era of Industrial Internet of Things (IIoT) and technical glitches hampering the entire operational process. Technical issues related to any sensing element in postal automation systems could halt the entire operation; these may also result in a delay in delivery of mails and parcels. Moreover, any sudden problem in control software would lead to improper functioning of automated systems, leading to a delay in the complete process of sorting and delivering mails. Some of the key players in the market are Siemens (Germany), Toshiba (Japan), NEC (Japan), SOLYSTIC (France), Pitney Bowes (US), Vanderlande (Japan), Fives Group (France), Leonardo (Italy), Lockheed Martin (US), Beumer Group (US), Dematic (US), Interroll (Switzerland), Eurosort Systems (Netherlands), Intelligrated (US), Fluence Automation (US), Bastian Solutions (US), Bowe Systec (Germany), GBI Intralogistics (US), ID Mail Systems (US), Opex (US), Planet Intelligent Systems (Germany), and OCM SRl (Italy). These players are focusing on contracts and agreements to expand their businesses.